New for November 2008! There's a very good Wikipedia article on SIGABA. 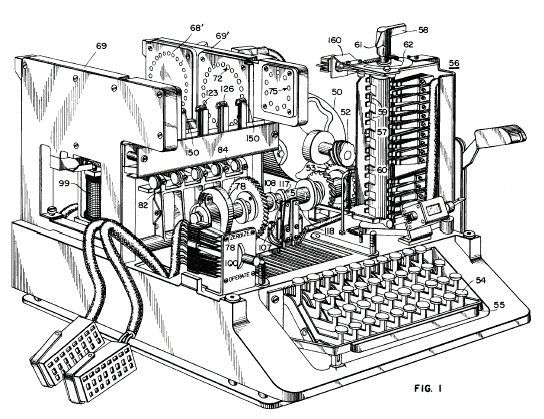 You can think of this equipment as an American version of Enigma, the encrytor used by Germany which was decrypted by a combined effort of Poles and Brits, and an occasional misplaced code book. We're not going to get too deep into the theory of encryption on this microwave web site, but we will discuss how the encrypted information was transmitted, typically using frequency-shift keying by the signal corps. Very interesting about the FSK (frequency shift keying). This method was used for in-the-clear messages, as well as encrypted ones. You realize that this was an attempt (successful) to avoid static interference which was encountered in simple AM transmissions. This was a crude form of FM, and it worked....AM static was suppressed in this type of transmission. The hardware that accomplished the FSK was called the "Pea" shifter; a no-larger-than-your-hand module, made by the Philadelphia Electric Agency. It bridged the master (crystal-controlled) oscillator with a series network consisting of a fixed capacitor and a vacuum tube, the plate-to-cathode resistance controlled by the step-modulated bias on the control grid. This series R-C circuit can be translated into a parallel RC equivalent, with both the R and C components shifting as the grid bias is changed. The shift in the resistance component was not wanted, resulting in the touchiness of this device, but the shift in the capacitance was the desired factor, usually adjusted to a one kHz shift. The speed of the data was not sufficient to cause any marked spillover beyond the one kHz bandwidth....the mechanical teletypes manufactured by IBM generally spat out about three seven-bit characters (ASCII) per second; and you can do the math. We were always adjusting these Pea shifters, both to set up the one kHz shift and to avoid killing the oscillator circuit, due to the shift in tank resistance. Eye wish Eye had one of the damn things as a souvenir. This setup was operated over the 2-30 MHz band, for over-the-horizon transmissions. We worked Honolulu from Nanking with our link, with Honolulu patching us through to the Pentagon. If anyone has any more info on the Pea shifter, please share it!